TVS Radeon Price, EMI, Specs, Images, Mileage and Colours : TVS Motor Company, a reputed manufacturer of two-wheelers and three-wheelers, today launched a new 110cc commuter motorcycle – TVS Radeon. A unique combination of sturdy metal build, robust style and plush comfort, TVS Radeon is targeted at the confident self-made Indian man. With the inclusion of this offering, TVS Motor Company’s robust commuter motorcycle portfolio has been further strengthened with a clear emphasis on developing products which not only meet distinct customer requirements but also create customer delight. 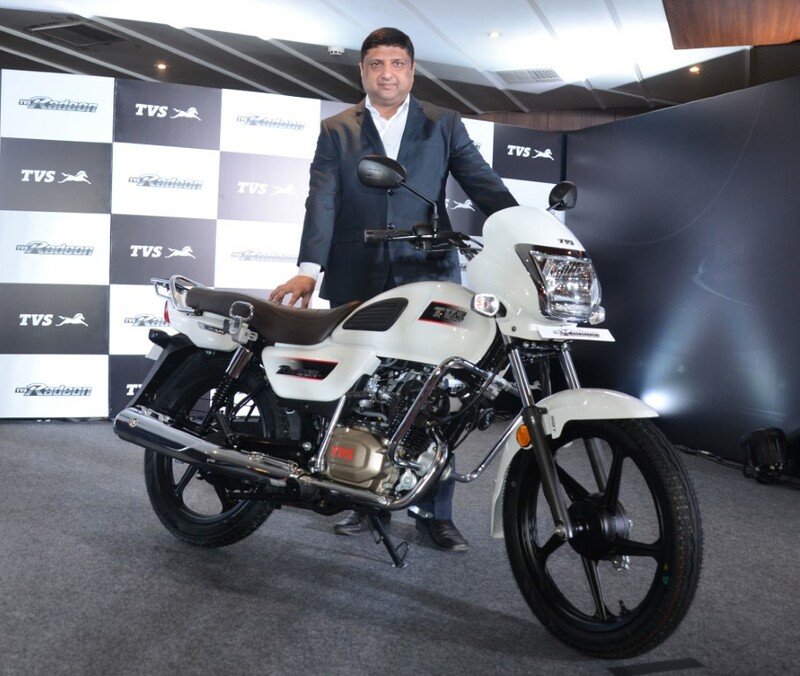 Commenting at the launch event, Mr. Aniruddha Haldar, Vice President (marketing) – Commuter Motorcycles, Scooters & Corporate Brand, TVS Motor Company, said, “We are delighted to launch TVS Radeon here today, targeting the discerning progressive customers. TVS Radeon boasts of the largest cushioned seat in the segment, both in terms of length and width. The telescopic oil damped front suspension together with 5-step adjustable rear hydraulic shock absorber aid both comfort and longevity. The motorcycle provides a steady ride boasting of a long wheelbase of 1265 mm coupled with the high ground clearance of 180 mm. The riding experience is made seamless with a low seat height, self-start and handy functional features like a USB charging2 spot and convenient pillion grab-rail. The motorcycle boasts of a stable, horizontal, design with stylish chrome ascents. The powerful headlamp, with a chrome bezel, is integrated with DRL (Daytime Running Lamps). TVS Radeon bespeaks a unique classic look with its stylish petrol tank’s ribbed thigh pads, a chrome finished speedometer, shock absorber shroud and silencer. TVS Radeon houses a long lasting 109.7cc Dura-Life engine, which is designed to offer an optimum combination of power and fuel economy. The motorcycle churns out 8.4 PS of power @ 7000 rpm with a torque of 8.7 Nm @5000 rpm. TVS Radeon is equipped with 10-liter tank and clocks a fuel economy of 69.3 kmpl3. Complete with a 5-year warranty, TVS Radeon comes in a colour selection of White, Beige, Purple and Black. This Karwa Chauth – Mix trend with tradition!